All of the forms and graphics are included on the interactive and customizable CD-ROM! Learning stations are work sites where significant learning objectives and flexible group interactions are accomplished without requiring much classroom space. 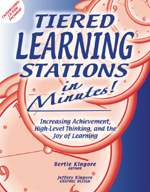 Tiered stations promote continuous learning for all students at appropriate yet varied levels of complexity. The included Tool Box CD-ROM provides all of the customizable graphics, organizers, and templates that you need to implement tiered learning stations. Engage students in joyful learning.